Jake Whitehouse’s remarkable collection of postcards illustrates his wider interest in local history and the Staffordshire landscape. Many of these postcards provide context for the Great War Camps on Cannock Chase. They show the places the troops would have frequented during World War 1: Milford Common, the Brine Baths in Stafford, churches, public houses, shops, cafes, villages and towns. Many more are of Staffordshire places surrounding Cannock Chase and further afield, from the late 19th century until the 1980s. Cannock, Hednesford, Rugeley, Stafford, Penkridge, Brocton and the Haywoods are well represented, but the collection ranges as far as Church Eaton and Brewood to the west, Alrewas and King’s Bromley to the east, Mucklestone in the north, and Great Wyrley and Brownhills to the south. Many of these are rare, if not unique images. Although plain postcards had existed since 1870, picture postcards were first introduced in the United Kingdom in 1894 by E.T.W. Dennis of Scarborough. What became the standard size for postcards, 5 ½ inches by 3 ½ inches, was introduced in 1899. At this time only the address could be written on the reverse, so publishers tended to leave a border or space for a message on the front, picture side. In 1902 the ‘divided back’ was introduced: messages could be written on one half and the address on the other. 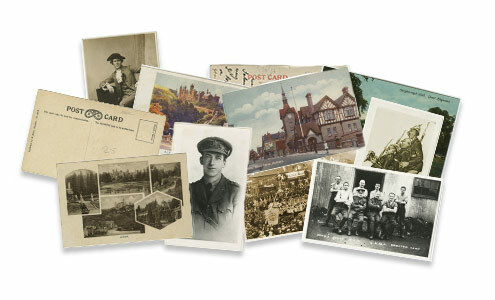 The period up to the start of the Great War was the heyday of postcard production, and the majority of the cards in the Jake Whitehouse collection date from these years. During the Great War postcards remained immensely popular; they were the main means of communication between soldiers and their loved ones, as well as being a handy way of sending a photograph of themselves as a keepsake. A noticeable change was that postcards were no longer printed in Germany. After the war postcard production continued, albeit at a lower level, and indeed they are still produced and sent today.